The Clean Architecture suggests to let a use case interactor call the actual implementation of the presenter (which is injected, following the DIP) to handle the response/display. However, I see people implementing this architecture, returning the output data from the interactor, and then let the controller (in the adapter layer) decide how to handle it. Is the second solution leaking application responsibilities out of the application layer, in addition to not clearly defining input and output ports to the interactor? 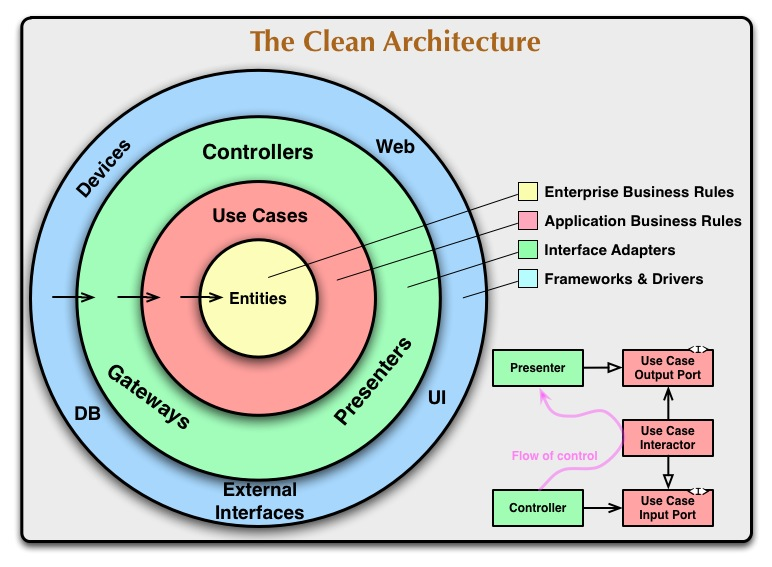 Considering the Clean Architecture definition, and especially the little flow diagram describing relationships between a controller, a use case interactor, and a presenter, I'm not sure if I correctly understand what the "Use Case Output Port" should be. Clean architecture, like hexagonal architecture, distinguishes between primary ports (methods) and secondary ports (interfaces to be implemented by adapters). Following the communication flow, I expect the "Use Case Input Port" to be a primary port (thus, just a method), and the "Use Case Output Port" an interface to be implemented, perhaps a constructor argument taking the actual adapter, so that the interactor can use it. 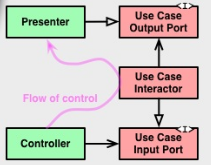 The previous interpretation seems to be confirmed by the aforementioned diagram itself, where the relation between the controller and the input port is represented by a solid arrow with a "sharp" head (UML for "association", meaning "has a", where the controller "has a" use case), while the relation between the presenter and the output port is represented by a solid arrow with a "white" head (UML for "inheritance", which is not the one for "implementation", but probably that's the meaning anyway). Clicking on the map causes either the placePinController to be invoked. It gathers the location of the click, and any other contextual data, constructs a placePinRequest data structure and passes it to the PlacePinInteractor which checks the location of the pin, validates it if necessary, create a Place entity to record the pin, constructs a EditPlaceReponse object and passes it to the EditPlacePresenter which brings up the place editor screen. The software in this layer is a set of adapters that convert data from the format most convenient for the use cases and entities, to the format most convenient for some external agency such as the Database or the Web. from the original article, talking about Interface Adapters. However, my problem with this approach is that the use case must take care of the presentation itself. Now, I see that the purpose of the Presenter interface is to be abstract enough to represent several different types of presenters (GUI, Web, CLI, etc. ), and that it really just means "output", which is something a use case might very well have, but still I'm not totally confident with it. This is attractive because we're moving the responsibility of "calling" the presentation out of the use case, so the use case doesn't concern itself with knowing what to do with the data anymore, rather just with providing the data. Also, in this case we're still not breaking the dependency rule, because the use case still doesn't know anything about the outer layer. However, the use case doesn't control the moment when the actual presentation is performed anymore (which may be useful, for example to do additional stuff at that point, like logging, or to abort it altogether if necessary). Also, notice that we lost the Use Case Input Port, because now the controller is only using the getData() method (which is our new output port). Furthermore, it looks to me that we're breaking the "tell, don't ask" principle here, because we're asking the interactor for some data to do something with it, rather than telling it to do the actual thing in the first place. So, is any of these two alternatives the "correct" interpretation of the Use Case Output Port according to the Clean Architecture? Are they both viable? The Clean Architecture suggests to let a use case interactor call the actual implementation of the presenter (which is injected, following the DIP) to handle the response/display. However, I see people implementing this architecture, returning the output data from the interactor, and then let the controller (in the adapter layer) decide how to handle it. 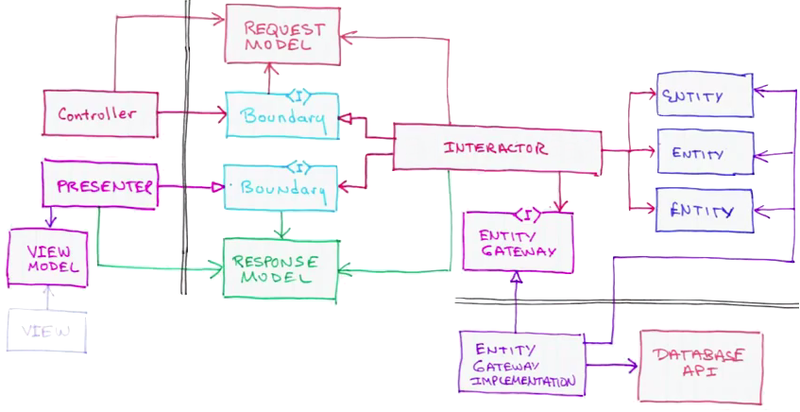 You can use many different ways to communicate between modules and call it MVC. Telling me something uses MVC doesn't really tell me how the components communicate. That isn't standardized. All it tells me is that there are at least three components focused on their three responsibilities. And every one of those can justifiably be called MVC. Anyway, none of those really capture what the buzzword architectures (Clean, Onion, and Hex) are all asking you to do. One thing that should be clear here is that the response model does not go marching through the controller. If you are eagle eye'd, you might have noticed that only the buzzword architectures completely avoid circular dependencies. Importantly, it means the impact of a code change won't spread by cycling through components. The change will stop when it hits code that doesn't care about it. Wonder if they turned it upside down so that the flow of control would go through clockwise. More on that, and these "white" arrow heads, later. Is the second solution leaking application responsibilities out of the application layer, in addition to not clearly defining input and output ports to the interactor? Since communication from Controller to Presenter is meant to go through the application "layer" then yes making the Controller do part of the Presenters job is likely a leak. This is my chief criticism of VIPER architecture. Why separating these is so important could probably be best understood by studying Command Query Responsibility Segregation. It's the API that you send output through, for this particular use case. It's no more than that. The interactor for this use case doesn't need to know, nor want to know, if output is going to a GUI, a CLI, a log, or an audio speaker. All the interactor needs to know is the very simplest API possible that will let it report the results of it's work. The reason the output port is different from the input port is that it must not be OWNED by the layer that it abstracts. That is, the layer that it abstracts must not be allowed to dictate changes to it. Only the application layer and it's author should decide that the output port can change. This is in contrast to the input port which is owned by the layer it abstracts. Only the application layer author should decide if it's input port should change. Following these rules preserves the idea that the application layer, or any inner layer, does not know anything at all about the outer layers. You can let the flow of control go in the opposite direction of dependency! That means the inner layer doesn't have to know about the outer layer and yet you can dive into the inner layer and come back out! Doing that has nothing to do with using the "interface" keyword. You could do this with an abstract class. Heck you could do it with a (ick) concrete class so long as it can be extended. It's simply nice to do it with something that focuses only on defining the API that Presenter must implement. The open arrow is only asking for polymorphism. What kind is up to you. Why reversing the direction of that dependency is so important can be learned by studying the Dependency Inversion Principle. I mapped that principle onto these diagrams here. No that's really it. The point of making sure the inner layers don't know about the outer layers is that we can remove, replace, or refactor the outer layers confident that doing so wont break anything in the inner layers. What they don't know about won't hurt them. If we can do that we can change the outer ones to whatever we want. The problem here is now whatever knows how to ask for the data has to also be the thing that accepts the data. 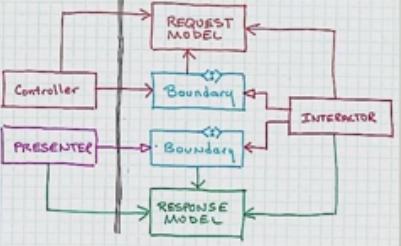 Before the Controller could call the Usecase Interactor blissfully unaware of what the Response Model would look like, where it should go, and, heh, how to present it. Again, please study Command Query Responsibility Segregation to see why that's important. Yes! Telling, not asking, will help keep this object oriented rather than procedural. Anything that works is viable. But I wouldn't say that the second option you presented faithfully follows Clean Architecture. It might be something that works. But it's not what Clean Architecture asks for. "The purpose of the presenter is to decouple the use cases from the format of the UI. In your example, the $response variable is created by the interactor, but is used by the view. This couples the interactor to the view. For example, let's say that one of the fields in the $response object is a date. That field would be a binary date object that could be rendered in many different date formats. The wants a very specific date format, perhaps DD/MM/YYYY. Whose responsibility is it to create the format? If the interactor creates that format, then it knows too much about the View. But if the view takes the binary date object then it knows too much about the interactor. "The presenter's job is to take the data from the response object and format it for the View. Neither the view nor the interactor know about each other's formats." Even though I generally agree with the answer from @CandiedOrange, I would also see benefit in the approach where the interactor just retruns data which is then passed by the controller to the presenter. This for example is a simple way to use the ideas of the Clean Architecture (Dependency Rule) in the context of Asp.Net MVC. A use case can contain either the presenter or returning data, depends on what is required by the application flow. Domain Object: A domain object is the data container in domain layer on which business logic operations are carried. View Model: Domain Objects are usually mapped to view models in application layer to make them compatible and friendly to user interface. 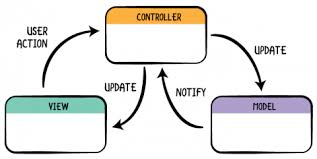 Presenter: While a controller in application layer typically invokes a use case, but it is advisable to delegate the domain to view model mapping logic to separate class (following Single Responsibility Principle), which is called “Presenter”. In a usual case, a use case simply returns a domain object to application layer that can further be processed in application layer to make it friendly to show in UI. 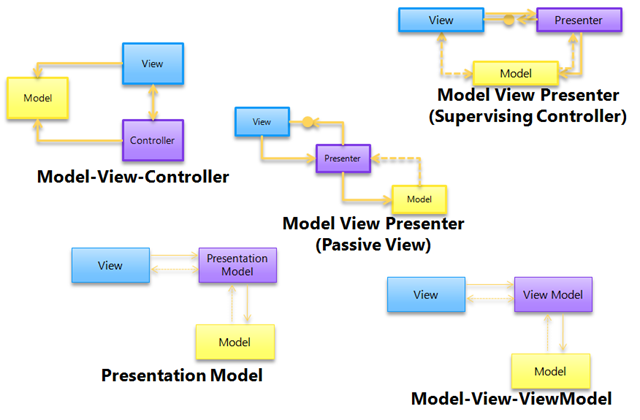 As the controller is responsible to invoke use case, in this case it also contains a reference of the respective presenter to conduct domain to view model mapping before sending it to view to be rendered. // Usually frameworks like automapper to the mapping job. // Usually frameworks like asp.net mvc provides url routing mechanism to reach here through this type of class. var presenter = new Presenter();//presenter might be initiated via dependency injection. // Usually frameworks like asp.net mvc provides mechanism to render html based view through this type of class. While not common, but it is possible that the use case may need to call the presenter. In that case instead of holding the concrete reference of the presenter, it is advisable to consider an interface (or abstract class) as the reference point (which should be initialized in run time via dependency injection). 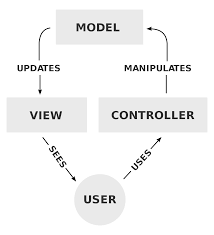 Having the domain to view model mapping logic in a separate class (instead of inside the controller) also breaks the circular dependency between controller and use case (when reference to the mapping logic is required by the use case class). Below is simplified implementation of the control flow as illustrated in the original article, that demonstrates how it can be done. Please note that unlike shown in the diagram, for the sake of simplicity UseCaseInteractor is a concrete class. IPresenter presenter = new Presenter();//presenter might be initiated via dependency injection. Use case containing the presenter or returning data? With his Clean Architecture, Uncle Bob's attempt is to synthesizes a bunch of known architectures to reveal important concepts and components for us to comply widely with OOP principles. // A generic "entity type agnostic" use case encapsulating the interaction logic itself. // "entity type aware" use cases encapsulating the interaction logic WITH the specific entity type. Note that it is analogously closer of UML use cases including/extending each other and defined as reusable on different subjects (the entities). However, the use case doesn't control the moment when the actual presentation is performed anymore (which may be useful, for example to do additional stuff at that point, like logging, or to abort it altogether if necessary). Not sure to understand what you mean with this, why would you need to "control" the presentation performation? Don't you control it as long as you don't return the use case response? Not the answer you're looking for? Browse other questions tagged architecture architectural-patterns onion-architecture or ask your own question. Keeping “code” away from designers? Android - Clean Architecture - best way to structure packages?